Adding motion to the mix, Philips Hue's outdoor motion sensor is the latest in its smart lighting devices lineup. Smart lights are useful in both form and function, as they add ambiance, sophistication, and a high-tech touch to the home, both inside and out. Economically-friendly and fun to use, they're a favorite among the smart home set, replacing the basic bulb with something far more modern. Along with light to lead the way, Philips Hue Outdoor Sensor provides peace of mind, with a built-in alert system that automatically switches on as per your settings, detecting close-by motion. We tried the sensor in our test home, connecting it to Philips Hue own smart lights — and here's how it fared. What is Philips Hue Outdoor Sensor? Installation is very easy, and comes with mounting brackets and screws — which make it very convenient to install. First, you'll select a spot outside of your home where you want to monitor if something or someone is moving. Next, download and open the Philips Hue app, go to Settings, and then click to Accessory Setup. Here you will see a list of Philips Hue devices. Select Hue outdoor sensor and follow the easy-to-understand instructions. Prior to installing the sensor on your home, give it a test run. It would be a shame to mount the device only to learn it's not working properly. Once you're sure everything is in working order, install the outdoor sensor wherever you've decided: on your home, a fence, a post, or wherever you want to add a layer of security on your property. One tip to keep in mind during setup: Make sure you select the room in the app, that will react to the sensor. For instance, do you want the lights in your Den to turn on if motion is detected your bedroom? Or should the lights go on outside your front door when motion is detected in your drive way. The app is also where you can program what time you want the outdoor sensor to be activated, or whether you only want it to react at night or 24 hours a day. In this slide show, we will walk you through the setup process for your Philips Hue outdoor sensor using the Hue mobile app. We will show you the screens you will interact with during setup. The first place you go to in the Hue app is Settings tab on the lower right side of the app. Click on here to begin "add accessory". How well did this outdoor sensor perform? Overall, the sensor works as it should. The device is specifically designed to trigger an action when motion is detected outside the home and alerts you accordingly in real time — and it did just that. You can use the sensor to automatically turn on lights outside your home whenever motion is detected, or come on periodically after a pre-set period. The device is also easy to use and install inside your home. For instance, you can use it to turn on the lights in your bedroom or kitchen if motion is detected outside the home, a nice security feature. As an extra touch, you can even set the lights to change color or blink at any signs of motion in the Philips Hue app. The cost of the Philips Hue motion sensor is $49.95 and available on Philips Hue site and Amazon. This motion sensor is a useful add-on to the already advanced Philips Hue smart lighting system.system. The device makes for a nice security staple— and can even double as a notification system. For example, if you have a pool on your property, and want to know when people are jumping in your pool — at any time of the day — you can set up the motion sensor to turn on lights in the home or make them blink, change blue, or react in any way to alert you. In that same way, the sensor can turn on the lights when you come home or walk into the yard. The various ways you can set the sensor to work makes this a well-designed outdoor motion detector. We did find the price a little steep, especially when compared to other outdoor sensors. 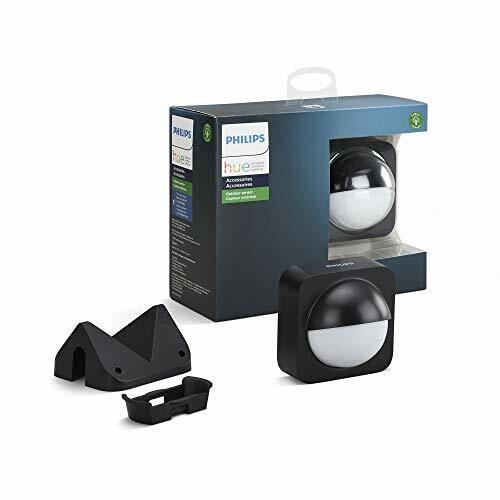 Most outdoor motion sensors can be picked up for less than the Philips Hue motion sensor. But those sensor won't work with Philips Hue products, so if you prefer Philips Hue's system, or are using its devices in your home, our recommendation is the Philips Hue motion sensor is worth the investment. You know the device is compatible with your lights and is easy to install and control using the its dedicated app. However, if you don't own a Philips Hue smart lighting system, this sensor isn't necessarily a need for your home, with lots of others out there to select at a lower cost. But keep in mind they most likely not have the type of integrations which Philips Hue offers you when building a smart home.